The official trailer has arrived for the upcoming Halloween-themed horror feature Honeyspider, which takes place in 1989 on Halloween day and follows a college student as she slowly unravels, while a mysterious stranger watches over her. Honeyspider is described as a cult throwback that pays homage to the classics, but also introduces original ideas to the genre. You can scroll down to watch the new trailer, and then let us know what you think in the comments! 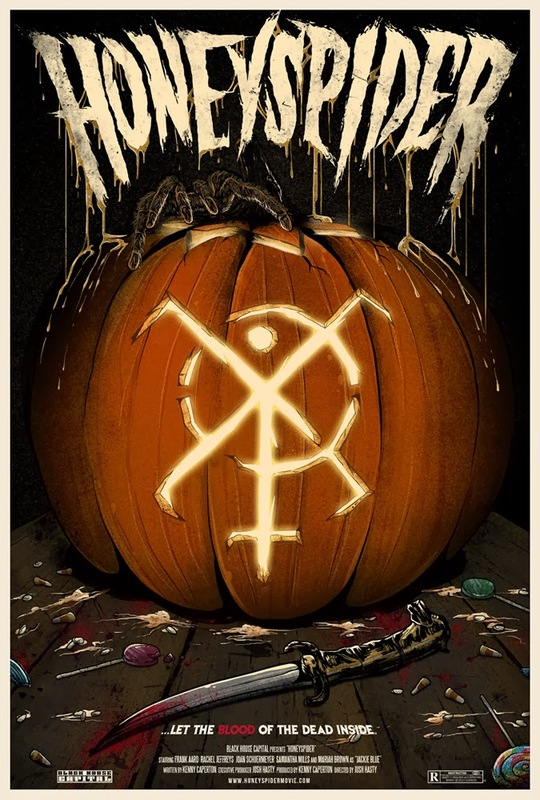 Written and produced by Kenny Caperton (owner of the infamous Myers House NC) and directed by Josh Hasty (A Mannequin in Static) of Black House Capital, Honeyspider stars Frank Aard (April Fool’s Day remake), Joan Schuermeyer (Zombieland and RZ’s Halloween II), Rachel Jeffreys, Samantha Mills (Bombshell Bloodbath) and newcomer Mariah Brown. The film will have its world premiere screening on October 18 at the Gem Theater in Kannapolis, North Carolina. It’s Halloween day in 1989 and college student Jackie Blue wants to enjoy a quiet birthday in the midst of a chaotic semester at school. Her friend Amber has other ideas and persuades Jackie to come to the annual Halloween party on campus after her shift at the local movie theater. As the night unfolds, it becomes apparent that Jackie will get more excitement than she bargained for on her birthday this year. The murder that plays out on the silver screen becomes an ominous parallel to reality, as Jackie falls under a strange spell while everyone around her is turning up dead. All the while, a mysterious stranger watches over Jackie’s every move as she succumbs to hallucinations and slowly unravels. Jackie finds herself helplessly trapped like prey in a spider’s web, and all she can do is try to survive the night! You can check out Honeyspider‘s official website HERE and be sure to look out for out inteview with cast member Jeff McLean coming later this month.